As so often happens in life, this seemingly unimportant piece of fiction took on a profound meaning in the days to follow. As my three faithful readers know, I’ve spent the last six months training for the St. George Marathon coming up in October. I’ve trained hard, stayed injury free (you may recall my unfortunate foot incident from last year) and have gotten incredibly excited about this fateful day which is now less than three weeks away. We’ve booked plane tickets and hotel rooms and I’ve had my jitters and the whole nine yards. So, the other night I’m out running, feeling great, and out of nowhere–whoosh!–a sharp, searing pain shoots up my left knee. I try to run on it–nope. I stop and walk for a while then try again. Nope. I walk the rest of the way home, ice it for awhile, it feels better, and I go to bed, not daring to think I may be truly injured. Daniel-san’s pleading to be healed, and oh, how he’s healed. Mr. Miyagi simply claps his hands together high in the air, rubs them for awhile (remember the cymbals?) and magically heals Daniel-san’s poor, victimized knee. Daniel-san then stands up and strides out to become the champion of the All-Valley Karate tournament, besting his enemies, winning his true love, and proving himself to the world. I don’t ask much. And I’ve quite a bit in common with Daniel-san: I dress five years behind, am kinda broke, and rely way too much on my mother. 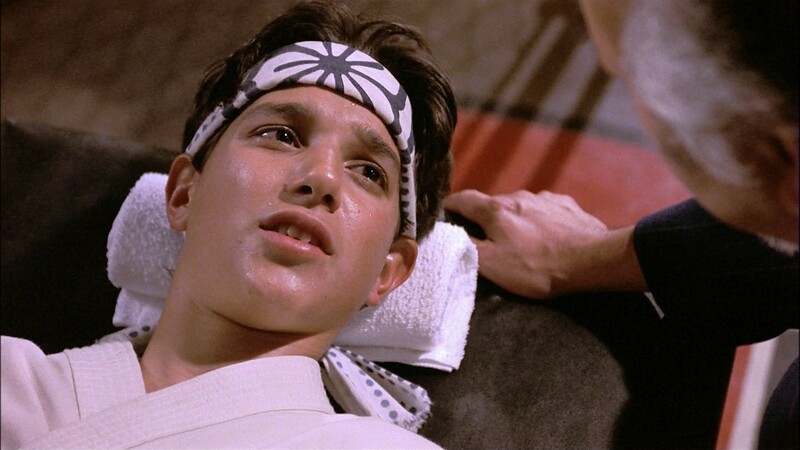 So, again, I’m asking the reader and the fates alike: Where is my Mr. Miyagi? What gives? I need his warm guidance, quiet strength, and pearls of wisdom. But mostly, I need that cymbal-crashing, hand-rubbing, far-eastern magic to fix me up real nice for this marathon. I need it bad. In the unlikely event that Pat Morita* does not read this and show up on my doorstep, does anyone have any other ideas? I’m a hurtin’. *and I just read that Pat Morita has died. which kinda ruins the story. sorry. to Pat’s family. and about the story. 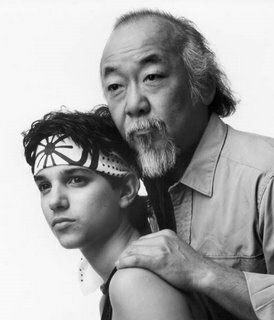 I didn't know Mr. Miyagi died! Why is no one telling me these things?! I just found out about Patrick Swayze a few days ago. That's what I get for letting my subscription to People expire. Sad, sad. By the way, we own that movie but had to stop watching it because my boys were trying out the moves on each other. Ouch! You are so funny but I am so sad about your injury!! I hope it heals so you can run! I wish we were close so we could watch and cheer you on – that is about all I could do for a marathon – maybe sip some MT. Dew along the road and scream go Jen!!! Oh well 🙂 Feel better soon! Jen…..come in to see us. We have seen runners before. Kirk can likely tell you if you can run on it or not. oh no Jen….Sorry to hear about the knee…I'd try getting in to see a sport med specialist pronto, and make sure he understands the importance of the race you've got coming up. my personal marathon obstacle turned out to be a needed root canal!! So last Saturday I finish my last long run (tapered to 12 miles) and wobble to the phone book looking for a dentist. I run Saturday and luckily found a dentist grounded enough to realize how badly I needed to run. So he worked an antibiotic schedule out for me, and put off the worst till Monday.I'm feeling pretty good now, pain killer free today. I hope you find a doctor who can help you manage the pain and do the race. Sorry I don't have any ideas on what it could be, either… Keep us updated. I could heal you, but you would have to wear the symbolic bandanna to the race. And paint my house, and fence, sand my floors and wash my cars. That makes me MAD! I hope it is just a Fluke thing… You deserve to have your MOMENT!!! And I hope your knee settles down for your race! Love this awesome post, Jen. 🙂 Thanks for the smile!